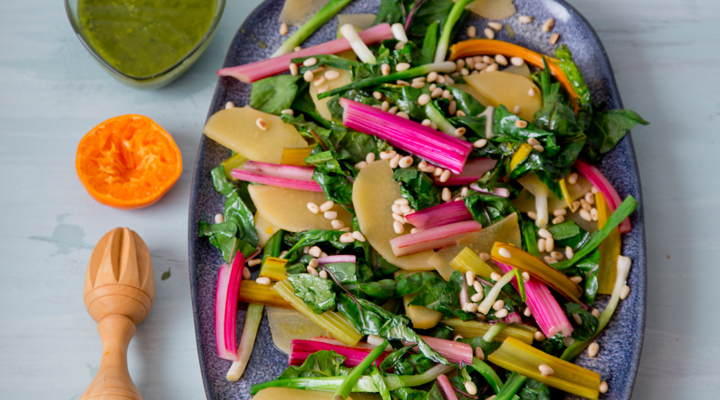 This warm salad is so full of flavour that you may well convert your turnip-hating family and friends. Bring the water to the boil, then crumble in the stock cube and add the citrus fruit to the pan. Add the turnip slices and poach for 8 to 10 minutes, until tender. Remove and put on kitchen paper to drain. Brush a griddle pan with olive oil and set over a medium-high heat. Add the salad onions to the hot pan and cook for 6 minutes, turning frequently, until lightly charred. Remove from the pan. Brush the griddle pan with more oil. Prep the Swiss chard by shredding the leaves and cutting the stems into 5cm pieces. Cook the chard leaves and stems on the griddle for 4 minutes, until wilted. Toast the pine nuts in a dry frying pan set over a low heat for 4 minutes, until golden brown. Pour the olive oil, cider vinegar, pesto, honey, salt and pepper into a medium glass jar. Put the lid on the jar tightly and give it a couple of shakes to emulsify the liquid. To serve, pile the warm vegetables onto a serving platter and drizzle on the pesto dressing, then sprinkle over the toasted pine nuts.